The kitchen is the heart of most people’s homes. If you’re ready looking for a Hoboken kitchen remodeling, look no further than the team at Modern Millwork Kitchen & Bath Studio to help design the kitchen you’ve been envisioning. Whether you are looking for a modern, traditional, or contemporary Hoboken kitchen remodeling theme, the team at Modern Millwork Kitchen & Bath Studio will exceed your expectations! We welcome jobs of all sizes and look forward to helping you with project. 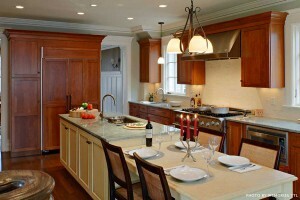 The benefits of a Hoboken kitchen remodeling project are many. Whether you are looking to increase the value of your home, add more space, change the layout of your kitchen and make it more functional and beautiful, or get those countertops and cabinets that you have always wanted. Your Hoboken kitchen remodeling expert team can accomplish all of these tasks. They will assist you every step of the way, answering your questions and concerns, and making sure that your budget is top priority. How do you start your Hoboken kitchen remodeling project? That’s a great question. First you should assess your kitchen needs; layout is the key to making the most of your space. Do you really need to completely rebuild your kitchen or will a simple face-lift do? What kind of a budget do you have to work with, and most importantly who do you hire? All of your Hoboken kitchen remodeling questions can be answered by calling Modern Millwork Kitchen & Bath Studio today! Your Hoboken kitchen remodeling project deserves the best, and that is what you will get with Modern Millwork Kitchen & Bath Studio. Visit our website and browse through our beautiful gallery of completed projects. Then give us a call today at 973-759-5943 and start your Hoboken kitchen remodeling project today! We will make your Hoboken kitchen remodeling dreams come true.